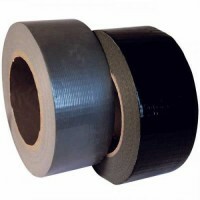 Gaffer Tape- Campbell International Specialist Tapes. Campbell International gaffa tape is a great general purpose cloth gaffa/gaffer tape. The tape uses a standard hot melt adhesive (standard adhesive, does not require heat). This tape delivers great quality at a great price. Sizes: 48mm x 50m - Box of 24 ..
Campbell International contractor gaffa tape is our most popular Cloth Tape that has been the industry favourite for many years, for many reasons! A good instant grab, a good waterproof backing and available in a range of 11 colours makes this the ideal Duct Tape for contractors throughout indust.. Please Contact us for prices. Campbell International Flame Retardant Duct Tape, it is the only tape to use in applications where flame retardance is required, seals duct work, fibreglass insulation and can be used for the wire harness industry. Please note this product is only available when ..
A strong durable Gaffa Tape with a moisture resistant, non reflective matt finish that is the choice of contractors working within the TV, Theatre and Film industry but has found many applications in industry world-wide. A strong tape available in a choice of colours. Sizes: 12mm x 50m - .. Please Contact us for prices. Campbell International nuclear grade PE coated cloth tape meets NRC and ASME Standards and has a high moisture resistance and high adhesion for difficult surfaces. Applications include holding dosimeters, sealing insulation, colour coding, wrapping pipe ends, sea..
Campbell International gaffa tape is a general purpose polythene laminated cloth tape that can be used for light industrial jobs and perfect for indoor maintenance applications. This is a real price fighter that delivers a great quality at a great price. Sizes: 12mm x 50m - Box of 96	19mm x 5.. Plain Scrim is a high tack, self adhesive fiberglass reinforced plasterers tape. Flexible to prevent bubbling. Size: 48mm x 90m - Box of 24 Please Contact Us for a price and lead time on this tape. ..
Campbell International premium gaffa tape was originally designed for the asbestos removal industry, this tape has high adhesion for difficult surfaces, has a crisp straight tear and resists twisting and curling. This tape saves you time and money as 1strip always does the job! Sizes:	48mm x 33m -..